A few days ago I published an article which was originally written for EPTA (European Piano Teachers Association) last year, and was published in the Piano Professional Magazine. This article focused on resolving tension at the piano (you can read it here), and many of you have subsequently contacted me asking for a few tips regarding tension, to remember whilst practising. So here are ten reminders! I hope they might be helpful. I’ve also added them as a PDF at the end of this post, so you can print out and keep by the piano. Check posture at the beginning of a practice session. Raised shoulders and tight muscles are sure signs of tension, so make a conscious effort to relax physically. As this tension is realised, the easier it becomes to correct, so be aware of how your body feels at all times. Drop both arms by your side when sitting at the piano, and remember the feeling of ‘heavy’ arms (i.e. totally relaxed). Replicate this physical stance when playing, as much as possible (at least for part of a practice session), and you will be on the way to developing a more comfortable disposition. When practising, learn to observe all hand and body movements, and by doing this you can begin to correct habits. With this in mind, memorising exercises and studies might be a good idea. Ensure wrists are always supple and pliable; they should be flexible, free and be able to move easily. Stiff, high or low wrists can cripple piano playing by seriously restricting movement. A free wrist motion is probably the most crucial of all; start by moving the wrists (not the arms or hands though) up and down, then in a circular or rotational motion. Do this away from the piano at first. Always observe fingers at the keyboard; joints must not ‘collapse’ because they need to support the fingers bestowing power and clarity. Try to ensure fingers are playing on their tips or pads. Many are not in favour of this method, but most students do respond well, and it allows them to become aware of the connection with each piano key as they play, as well as gain finger independence. Encourage finger strength by producing a large, but rich sound engaging every finger fully. 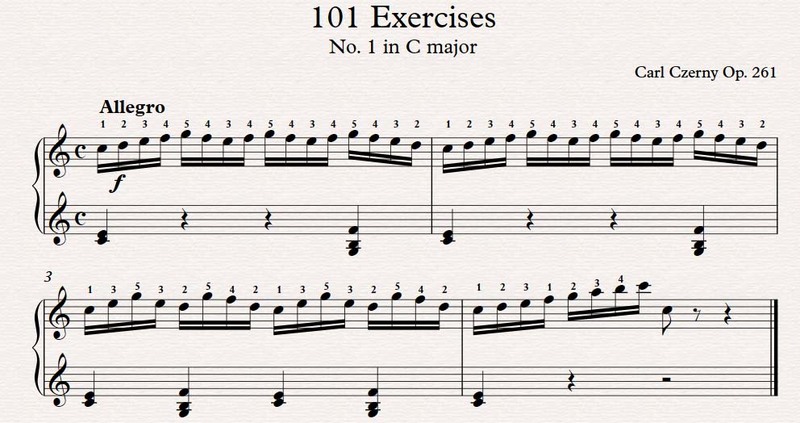 Do this by working very slowly at basic exercises (like the Czerny study below). After every note, release the wrist (and tension needed to play the note) by making a circular or rotational motion. When fingers are strong, the rest of the upper torso can relax and do its job; which is to support and cushion the fingers and help to produce a warm tone. Make observation, concentration and physical focus play a vital role when developing flexibility; awareness leads to correction. Start every practice session with 10-15 minutes of technical practice. If you’re not keen on studies or exercises, try working with short pieces, or even just a few scale passages. Good luck!